Paper | Plastic 3D Glasses — Rainbow Symphony, Inc.
You Can Select From a Wide Variety of 3D Glasses Applications and Styles! 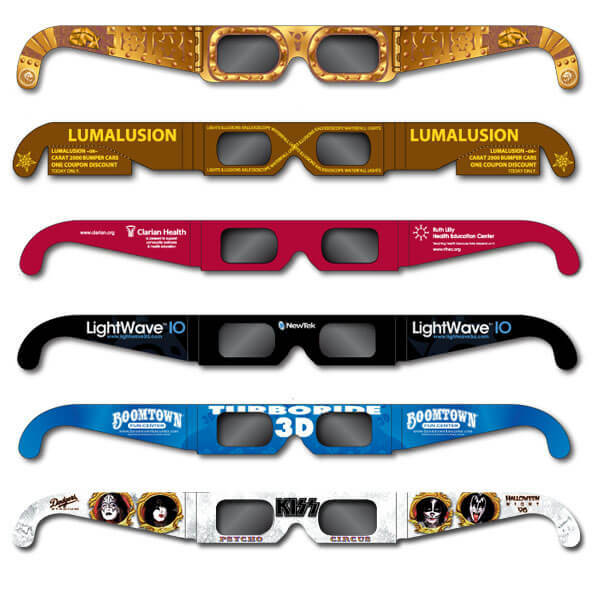 Rainbow Symphony is a leading manufacturer of 3D products with a wide selection of both custom paper and plastic 3D glasses. We have tons of different lenses and frame styles, so you can create 3D glasses—custom tailored to your needs. Get creative with your own custom design for any special event or promotion! Lenses of Red/Cyan, Red/Blue or Red/Green for interpreting anaglyph art. Used for viewing 3D comics, 3-D web sites, Movies and TV, 3D games, printing and art. Whatever you need...We can help create it! We have years of experience and references and happy to share them. Give us a call and talk to one of our seasoned "3D" staff. Both linear and circular polarizing lenses. 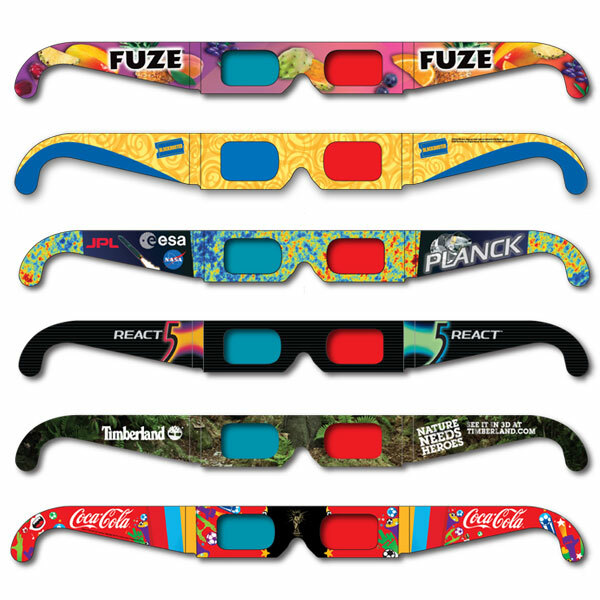 Polarized 3D glasses are used primarily for Passive 3D TV's, 3D laser shows, 3D ride simulators, multimedia displays, corporate presentations and special 3-D movies. The right choice when special requirements concerning price, format and space are the consideration. They can be made with any lens configuration and a full range of print options. Used primarily for direct mail campaigns, in-pack promotions and inserts for publications and magazines. Lenses of red/red, blue/blue or any identical colors. Decode secret messages, games, contests and sweepstakes. A great way to promote new products, win prizes and attract attention at trade shows. Our exclusive line of 3D Greets™ combines the convenience and economy of a self mailer with the impact of visual 3D enhancement. The 3D Greets format can be printed with any number of colors and a variety of different lens configurations. Get your message out with this affordable direct mail piece. Our line of Professional Plastic 3D Glasses offer an exciting breakthrough in affordable 3D imaging for the internet, TV’s, Movies, Blu-Ray, DVD’s and print. Our glasses and handheld viewers are meant for a variety of applications. Use our same color lenses at your next event for a secret reveal game, or choose our polarized lenses for corporate presentations and 3D ride simulators. We also have an exclusive line of greeting cards that combine the convenience of a self-mailer and the impact of 3D enhancement. 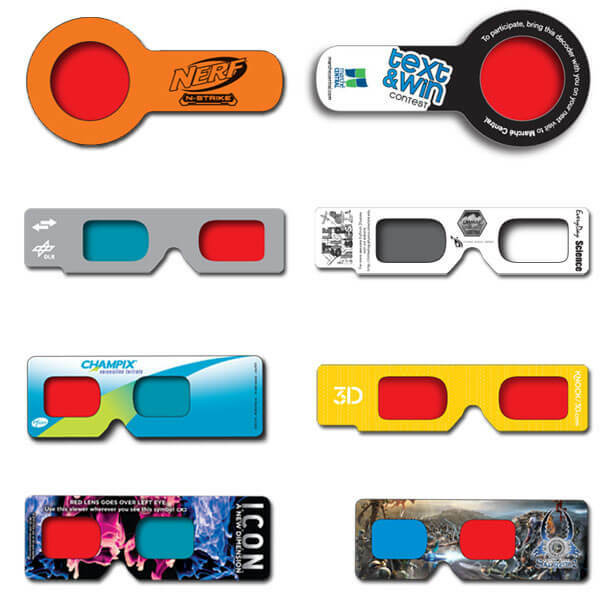 Pair your choice of lens handouts with our 3D Greets™ for an unforgettable way to promote your event, business, or organization! Whatever you need, we can help create it! 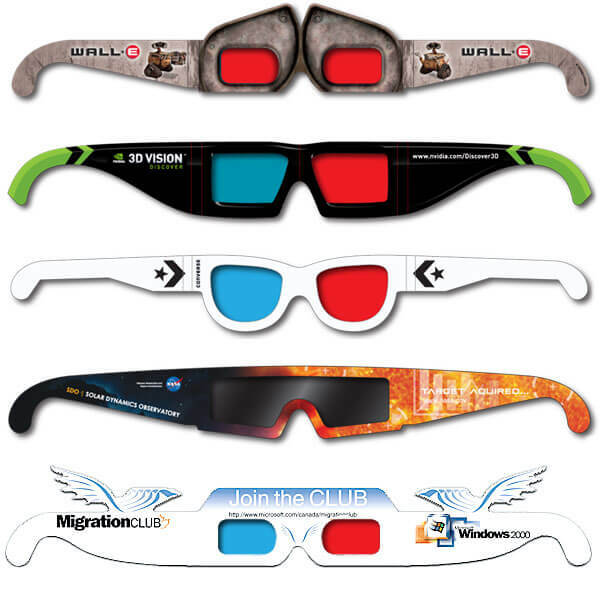 We have years of experience for creating custom 3D glasses, and we’re happy to share them with you. Any design you can think of can be applied to your frames and printed in bulk. Place your logo, name, or information on the frames and hand them out at your next event! Rainbow Symphony is your one-stop 3D shop. Our in-house, state-of-the-art graphics department and manufacturing facility will guide you through the entire process—from designing your custom 3D art to manufacturing your custom 3D glasses. We work with all platforms, file formats, and softwares. By interfacing with your graphics department, printer, and bindery, we can ensure the highest quality 3D product possible. We supply the digital 3D files to your printer, ready for production, and provide additional versions ready for publishing on the internet. Rainbow Symphony can match ink colors, lens colors, and paper stock to produce the best possible 3D product. Choose our team when you need the highest quality 3D printed products. Please contact Rainbow Symphony for custom printing and additional quantity discount pricing.